Two output options from the same twin-turbo V6 engine give Levante buyers the option of more performance, but AWD and an 8-speed automatic remain standard. 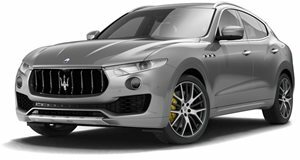 The 424hp Levante S offers the best performance with a 0-60mpg time of 5.0 seconds, while the standard Levante takes just 5.8 seconds. A $6 750 Zegna Package adds chrome exterior finishes, ventilated front seats with chevron-stitched Zegna silk inlays, and silk inlays around the cabin. Safety tech available includes ABS with EBD, a rear-view camera with the option of 360-degree camera, and adaptive cruise control with forward collision warning. Though the BMW X5 and Mercedes-Benz GLE offer suitable refinement, it’s the Porsche Cayenne that Maserati is targeting with its first SUV, the Levante. 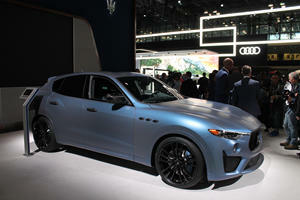 Following the same ethos as Porsche, the Levante SUV is to be the bulk seller that that will increase cash flow and enable Maserati to have disposable cash for other more true-to-type models. But with the bar set so high by the Cayenne, the Levante needs to be something truly special to lure buyers to the Italian way of life. Much as you’d expect from a premium Italian brand like Maserati, the interior of the Levante feels more high fashion than form follows function. There’s flair and character brought about by natural woods, milled aluminum, and the smell of rich leather in the cabin. But there’s a flipside to all these elements, one brought about by virtue of Maserati’s alignment in the FCA stable. Upon closer inspection, most of the switchgear is cheap plastic, common, and pulled straight from the cheapest Fiat and Jeep products. Is it still genuine Louis Vuitton if it has a spelling error on the label? As for practicalities, the Levante seats 5 in a spacious package that sits on par with competition like the Cayenne, X5, and GLE. Despite the sloping design to the rear of the roof, head room is only mildly limited, and comfort is assured on long journeys with a full entourage. Riding as standard on air suspension, the ride is h and well sorted. It adjusts height based on driving mode and speed, lifting for mild off-road work – which it handles with some credibility – and lowering for highway cruising. Body-control is impressive as the Levante resists lean around corners, even handling in a somewhat sporting manner – but in Sport mode the ride becomes a touch harsh, particularly on less than perfect roads where it borders on being jarring. A 50:50 weight distribution aids handling, but even though the AWD system is rear-biased and features torque vectoring by brake, understeer is still the prevalent trait. The steering is hydraulically assisted, but though the weighting is superb, it doesn’t communicate as a hydraulic setup should, particularly when reaching the limits of adhesion of the front wheels. In this regard, competitors offer more, but only just by a little. 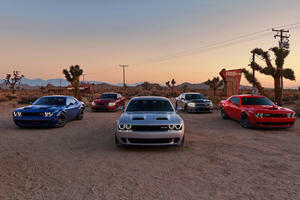 One engine is available in two states of tune, both driving all wheels through an 8-speed ZF automatic gearbox. The 3.0-liter twin-turbo V6 in standard trim offers up 345 horsepower and 369 lb-ft of torque, achieving the 0-60mph spring in a claimed 5.8 seconds. S trim ups the power outputs to 424hp and 428 lb-ft, with 0-60 occurring in 5 seconds dead. Both models suffer substantial turbo-lag when caught off boost, and require manual gearshifts to keep things on the boil. The gearbox can be manually operated by column mounted paddle-shifters. A standard 8.4-inch touch screen handles infotainment requirements superbly, while an optional 1280-watt, 17-speaker Bowers & Wilkins sound system is well worth the extra $5,200, though a 10-speaker Harman Kardon is on offer for just $2,000. Safety kit as standard includes traction and stability control, six airbags, ABS with EBD, and a rear-view camera. The optional Driver Assistance package ($3,000) adds adaptive cruise control, forward collision warning, lane departure warning, and a 360-degree camera. At the time of writing, the Levante hasn’t yet been crash tested. 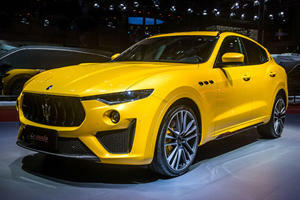 The Levante adds style and character to a segment known for boring. It’s by no means a class leader, but it’s a seriously capable all-rounder offering luxury, enjoyable driving dynamics, and a dash of Italian flare – not to mention the exclusivity of the trident badge. The retired NBA shooting guard shows off his custom Levante in New York. A merger is possible but selling Maserati is off the table.